When you’re trying to squeeze in a complete cleaning session as your child enjoys an extra-long nap, this is the routine to follow. You have enough time to do a little more than just fluff pillows, so use this step-by-step guide to get as much done as possible. The best part about this plan from Kaitlin Stearns at The Simply Organized Home is that each task has a recommended amount of time it should take to complete, so you won’t end up spending 30 minutes making one bed, only to leave 30 seconds for dusting. Download and print the free checklist so you can cross off each task as you work and feel good about the progress you’re making. Our homes are full of dozens of different surfaces, and to get each one sparkling clean (without damaging it), it's best to learn the right way to clean each material. The correct way to clean a granite countertop looks a lot different than the right way to wash painted walls, and getting clean, streak-free mirrors is another process entirely. So to get down to the bottom of the right way to clean all of these surfaces and more, we reached out to some cleaning pros for their best advice. 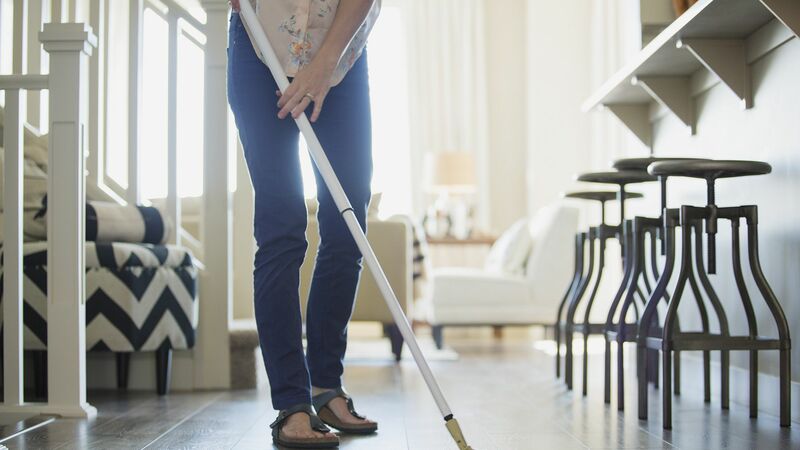 To keep laminate floors clean, you’ll first want to make sure you’re vacuuming at least twice a week to prevent scratches from debris, says Debra Johnson, a Merry Maids home cleaning expert. She recommends misting your floors in small sections, using a 32-ounce spray bottle of water mixed with ¼-cup vinegar. Then use a flat mop with a damp microfiber floor pad to go over the areas you’ve sprayed, washing in the direction the laminate is laid. Be sure to rinse (and wring out) the floor pad as needed during your cleaning, and use a dry microfiber cloth to dry the area. According to Johnson, you don’t want any dampness left behind on your laminate floors. Many people choose granite for their kitchen counters because it both looks great and holds up. However, that glossy finish is due to a sealant, which can wear down over time, so it’s best to be cautious when cleaning stone counters. “The best method for cleaning countertops is to clean as you go, and not allow leftover grease, food particles, and other debris to set into the surface,” says Johnson. She recommends doing a quick wipe down of the counter after the busy morning routine (which tends to include coffee, breakfast, and lunch-prep). “Wet a microfiber cloth with warm water, add dishwashing detergent, and then wash the countertops with the lather,” she recommends. “Then, rinse the soap from the cloth, wring it well, and use it to wipe off the countertops.” You can also use a stone cleaner like Better Life Granite and Stone Cleaner. The more often you clean up after cooking and meals, the quicker it will go. Mix all ingredients together in a spray bottle, spritz the solution onto a microfiber cloth (instead of directly onto the glass), and use it to wipe down any glass surfaces. Tip: Another one of our home editors' favorite tricks? Be sure to wipe glass and mirrors following an "s" pattern, rather than a circle, to avoid re-depositing any dust the cloth has picked up back onto the surface. Dust winds up just sticking to any cleaning product used on wood, so just dust your furniture weekly using a microfiber wand. To keep unpainted wood looking healthy and shiny (and prevent cracking during the cold winter months), Rapinchuk recommends using a beeswax polish and conditioner ($8 on Amazon). Once again, frequency is key when it comes to cleaning bathroom tiles—the more you do it, the easier it is to maintain. “To keep soap scum and mildew at bay, I like to mix ½ cup vodka, 1 cup water, and 10 drops of peppermint essential oil in a spray bottle. I spritz the tiles daily, no rinsing necessary,” recommends Rapinchuk. In addition, you’ll want to do a weekly maintenance cleaning, using a bathroom cleaner and a scrub brush or a damp microfiber cloth. If mildew is present, Johnson has cleaning recommendations for both stone and ceramic tiles. “On stone surfaces, put a couple of drops of dishwashing liquid on a microfiber cloth, rub it together to make suds. Scrub the stone and rinse with warm water.” For ceramic with grout, she suggests mixing ½ cup baking soda, 2 drops of dishwashing liquid, and enough water to form a paste. Apply it with a brush or cloth, let it sit for 30 to 45 minutes, and then rinse with warm water. She adds that you may need to repeat the process several times to get the surface sparkling. You’ll want to wash wood floors weekly to prevent debris and pebbles from scratching up the surface. Start by sweeping or vacuuming to remove any large debris. Then, Rapinchuk recommends mixing 2 cups warm water, 1 to 2 drops of Sal Suds ($21 on Amazon) or castile soap, and 3 to 5 drops of your favorite essential oil (for scent) in a spray bottle. Then spritz it in small areas and wipe clean with a damp microfiber mop. If you’ve just got a small spot to clean off (like, say, from a kid's Cheetos-dust-stained handprint), use a Magic Eraser ($17 on Amazon) to wipe away the stain. Johnson suggests testing it on a small, inconspicuous spot first to make sure it doesn’t fade the paint. To do a more extensive washing of dirty walls, she recommends first using a dry dust mop to clean the walls from top to bottom. “Should the walls need washing, mix a gallon of warm water with a couple of drops of mild dishwashing liquid," says Johnson. "Dip a flat mop with a microfiber cover in the sudsy water and wring well. Place the cover on the mop and clean the wall from bottom to top, left to right, to avoid water dripping down the walls." It's the next best thing to giving the wall a fresh coat of paint.